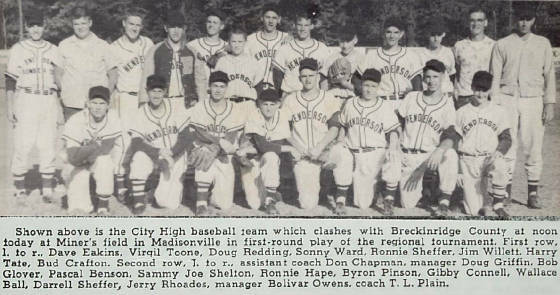 The Henderson City High Flash (Hens) baseball team completed the 1956 season with a 22-3 record, finishing 3rd in the Ketucky High School (KHSAA) baseball tournament. The City High team was led by all-state performers Pascal Benson, Sammy Joe Shelton Ronnie Sheffer and Doug Redding. The Hens defeated McKell High 7-4, and then lost to Murray High 4-5 in the semi-finals, and went on to claim the 3rd place trophy with a victory over previously top ranked Newport Catholic 6-3. 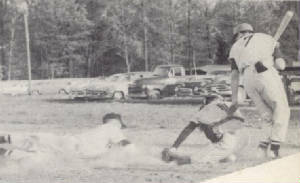 Coach T. L. Plain's squad was led by leading slugger Sammy Joe Shelton and pitcher-outfielder Pascal Benson. Benson finished the year with a 9-1 record, which included a rare perfect game in a 12-0 victory in the district tournament over arch-rival Henderson Holy Name. Benson batted a team second high of .446 for his senior season. Doug Redding had a 6-1 record with a stingy 1.50 ERA and center-fielder slugging Sammy Joe Shelton finished the season with a .456 average to lead the City High team in hitting. Dave Eakins sliding at the homeplate, whilst Byron Pinson waits at bat. Pascal Benson sliding safely into home plate.